When I was running through the requirements of gear for the Amelle of the 'Sugarbabes' video 'Love is all we need' with Rodney Charters, the subject of a smoke machine came up, I said I had a super powerful one, Rodney took me at my word. All seemed good until it really started to sink in that everything in this shoot seemed to be so much bigger and remarkably engineered than most of the equipment I encounter when shooting video. We arrived at studio 3 of Park Royal studios and soon the subject of the smoke machine cropped up, I pointed to the small bag that my smoke machine was in, and it would be fair to say that quite a few faces dropped, indeed there were murmurings that the machine was simply too small for the job. It was a big studio after all and these folk did have all the gear delivered in a sizeable truck, I confess that even though I put up a spirited and confident defence of my smoke machine, that I did begin to have doubts. 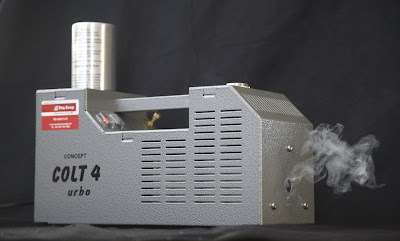 Faces dropped further when I unpacked and powered up my Concept Colt 4 Turbo smoke machine. 'We can get another one if you like?' came a voice. They were clearly used to much bigger machines. Perhaps they had a point, the studio was 80 feet long, 47 feet wide. As you can see from these screen shots I need not have worried. As you can see more than enough smoke. 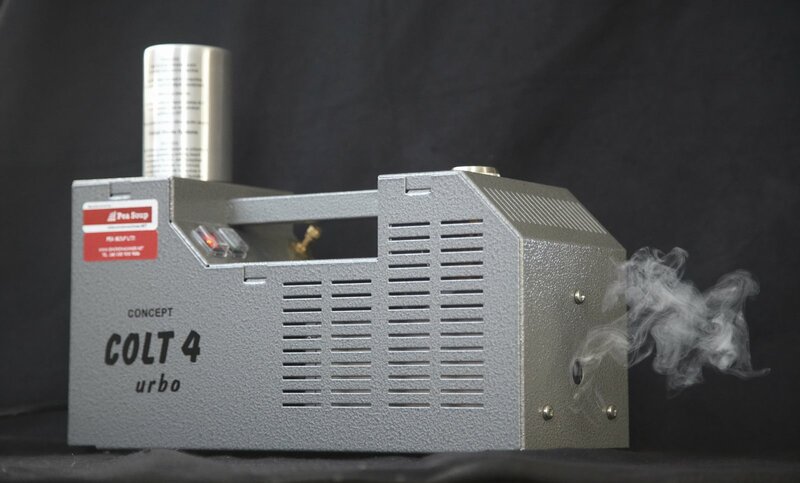 It is not how much smoke the machine emits but the quality of smoke. It hangs in the air for a considerable amount of time before having to be topped up, it is user friendly too, with the smoke aerosols being egg white, so safe to use. The crew were suitably impressed. They maybe thought it was going to work like the $30 machines the casual shooters get here on sale the day after Halloween at the gag gift shop. Those things are terrible. I am going to mark this one for future reference.